Six decades after it originated, and one after the concept of “mangroves as fish habitat” was formalized with the first scientific meeting of its kind, research linking mangroves and fish continues to grow and expand into new and exciting disciplines. 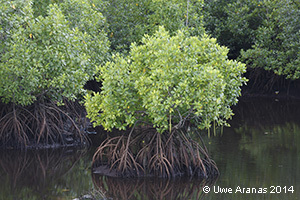 The First International Symposium on Mangroves as Fish Habitat in Miami (2006) revealed the thematic diversity that researchers around the world were exploring when studying fish and their relationships with mangrove ecosystems. Nursery and trophic functions, community ecology and connectivity, mangrove-fisheries linkages, and conservation and management were being studied with an array of techniques that included stable isotopes, biotelemetry, and otolith chemistry. The first meeting also revealed a growing interest in disturbance and habitat restoration to enhance nearshore fish biomass. The Second International Symposium on Mangroves as Fish Habitat in Mazatlán (2014) took the core scientific concepts of the first symposium and expanded them into a global exploration of mangrove-fishery values emphasizing the need to quantify and monetize mangrove-associated fisheries, and, for the first time, the analyses of large geographical data sets to establish the dependence on mangroves of several fish species at regional scales. Moreover, the second symposium also documented the potential impact of global climate change and other disturbances on mangroves and fishes. The goal of the Third International Symposium on Mangroves as Fish Habitat, to be held in November 2018, is to bring together scientists, researchers, industry professionals, economists, educators, and government officials, with the goal of "Connecting the Hemispheres." Decades of research on the function of mangroves as fish habitat have found that there maybe differeing processes occurring in the Eastern and Western hemispheres. Whether it be driven by differences in tides, evolutionary histories, or differing species life-histories, there is an uncertainty about the global role that mangroves play as critical habitat in the new vs old worlds. This symposium aims to examine the relationships between fishes and mangroves in each hemisphere, to identify gaps in our knowledge, and to chart a course for future global research on mangroves as fish habitat. Proceedings of the symposium will be published in a special issue of the Bulletin of Marine Science.